An uprising by Natick cobblers nearly 160 years ago led to the biggest pre-Civil War labor strike in the United States. Eventually the walkout spread to 25 towns and involved about 20,000 workers. Within a month the workers gave up and returned to work. Shoemaking was king in Natick in the mid-1800s. About 1,050 men and women—almost 20% of the population, and about 75% of the workforce—were employed in the shoe industry. However, in 1860 a “cordwainer” and his family had a tough time making ends meet. Shoemaking in Natick got started about 1830 as a “putting out” or “cottage industry” enterprise. Shoes were made by hand in the homes of workers and in “ten-footer” workshops all over town, and wagons took finished shoes to Boston. By 1835 the new Boston & Worcester Railroad had a station in downtown Natick—the shoe industry boomed, and supporting businesses sprang up: a tannery, the Natick Box and Board Company, and a wagon maker. 19th century “cordwainers” made new shoes in their “ten-footer” workshops. Most Natick shoes were heavy work shoes, including the “brogan” which was purchased in large quantities by Southern planters for their slave crews. In 1858 a sewing machine for shoes was patented, and the shoemaking business model changed drastically. Machine-stitching greatly enhanced production capability, but it minimized the function and cut the pay of the shoe workers in their homes—in some cases every member of the family was employed in making shoes, and pay cuts made their situation bleak. Henry Wilson’s “ten-footer” workshop, preserved on W. Central Street in Natick. The nationwide financial Panic of 1857 had a rough impact on commerce everywhere, and Natick shoe companies were hard hit. Many workers lost their jobs and borrowed money to pay their bills. When the economy turned stronger, they were rehired, but with longer workdays and reduced pay. For 16-hour days, men earned $3 a week, and women were paid only $1. It wasn’t enough to support a family. 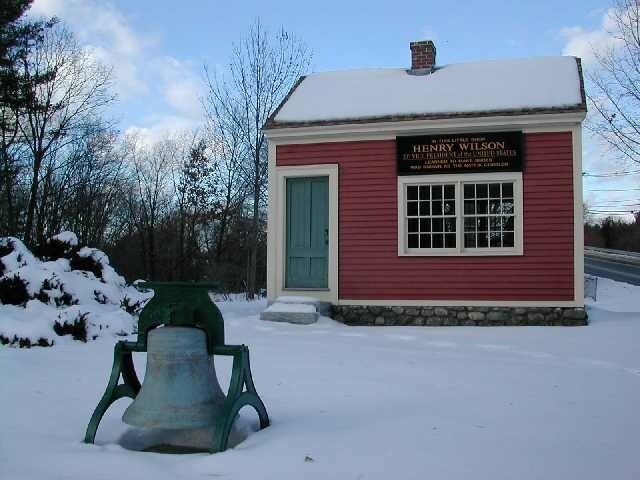 In February 1860 crowds of more than 500 Natick workers met several times in the Universalist Church. They formally resolved “that in our opinion the late reduction in the prices for bottoming shoes was uncalled for, oppressive, and unjust, therefore believing that no first quality shoe can be made for less than [20 cents] without injuring the laborer, and the best interests of the community.” In nearly two dozen towns in Massachusetts and New Hampshire strike committees formed rapidly.